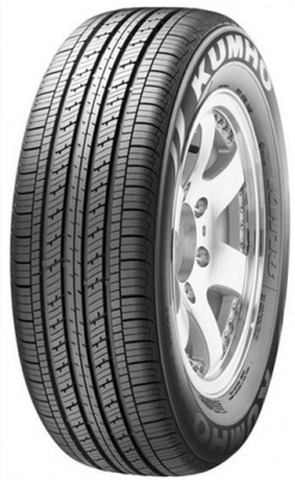 The all-season Kumho Solus KH18 performance tires deliver excellent ride comfort combined with exceptional safety. They feature a non-directional tread pattern with a continuous center patch that improves handling and braking performance. On wet surfaces, the grooves expel water to minimize the risk of hydroplaning while sipes provide additional grip. The sipes also minimize uneven tread wear to prolong tread life. The ribbed tread design minimizes rolling resistance to enhance fuel efficiency. P205/60R-15 440AA 1,356 lbs N/A N/A N/A N/A N/A 25"
Purchase includes the Kumho Solus KH18 tire only. The wheel rim shown in the picture is not included. Picture provided is a stock picture from the manufacturer and may or may not reflect the actual product being ordered. All Kumho Solus KH18 tires are continuously developing with manufactured improvements. With that said, Simple Tire and the manufacturers have the right to change these tire specifications at any time without notice or obligation. Please Note: Specifications of the Kumho Solus KH18 tires shown above are listed to be as accurate as possible based on the information provided to us by Kumho tires. I recently purchase these tire and,and I am surprise to see how good these tire are. For the price of these tire you can not go wrong.I drive the highway daily a few weeks ago we had several day of thunder storm, and these tire perform very well in the rain.